Mumbai is the city of love for me – it is the only place that I miss a lot. I did my graduation in Mumbai, and like every college going student, enjoyed a lot of the city. The first thing that comes to my mind when I think of Mumbai is the umpteen varieties of snacks that one can pick up from road-side stalls. I last went to Mumbai in 2009 – and I had been longing to go there once again. There was some reason to visit Mumbai as well – but the trip kept getting delayed time and again due to various reasons. The chance came up finally in December – I and my dad were heading to Mumbai. Trains were ruled out due to lack of tickets and the long running time. So bus it was. I had already shortlisted the operators that I’d look at for the trip (based on various reviews and timings). Selecting the final operator was based on the availability of seats in the front half of the bus and the arrival timings at Mumbai (I preferred an arrival before 9AM). VRL met all my requirements – so VRL it was. It was one very busy day at home – there were a function at home, and hence there were some guests. I and my dad rushed through lunch and were ready by around 2pm. My brother dropped us at the VRL Bus station in Anand Rao Circle. 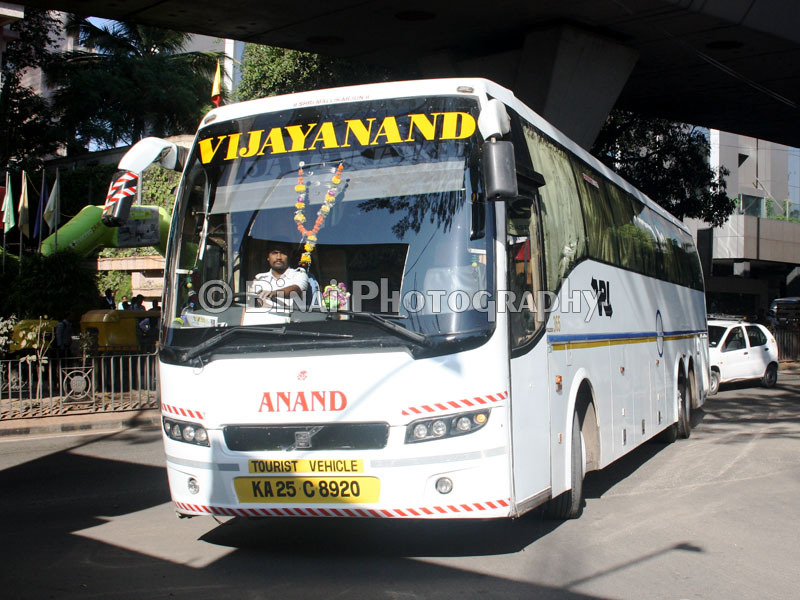 Vijayanand Roadlines Limited, or VRL, is one of the biggest private bus operators in India – they also own the highest number of Ashok Leyland Trucks. Given the size of the organisation, they have elaborate workshop facilities in Hubli (their headquarters) and Bangalore. They also have a full fledged IT backbone to manage the operations. As we were travelling to AR Circle, i received a message with the bus number and departure details. We were dropped at the VRL bus station at around 1455hrs. I just confirmed at the counter that my bus would be coming there. The bus station is a miniature government bus station – with the old styled metal benches and complete lack of signboards. The place also has a poorly kept toilet too. There is no PA system – there was one Volvo B9R parked in the departure stand, and one Non-AC seater/sleeper too came in at that time. That bus was also headed to Mumbai. My bus (KA-25-C-8920) came in at 1529hrs (for a scheduled departure at 1530hrs). Boarding started immediately – the attendant neatly tagged luggage and kept them in the luggage hold. He arranged the baggage according to the alighting point of the passengers. The interiors of the bus looked a bit tired, but appeared well maintained. The interiors did not smell very fresh. The crews were in uniform. The bus got moving at 1541hrs. The attendant came around with the chart and checked tickets quickly. He ensured that all the passengers booked from AR Circle were on board – he quickly listed out various pickup points as well. The second driver got into the “berth” soon after the bus got moving. VRL replaces one seat on the first row (left side window seat) with a crude contraption that resembles the stretcher in an Ambulance – its long enough for a 6 feet person. The drawback is that the passenger who sits in the left side window seat in the second row ends up sitting in an awkward position. A movie was played on the TV. VRL does not use conventional DVD players, but an HDD based player. A fairly decent collection of movies were saved in the hard disk – the attendant just needs to select the language and choose a movie – passengers get some choice as well! The first movie was a recent bollywood flick. The HDD player ensures that the movie does not get stuck in the middle, nor does it skip scenes when the bus goes on rough patches. The bus took a left turn after Mantri mall, and we headed towards Rajkumar road. We had a pick-up after Navrang (1603hrs) – the wait for passengers was fairly long here. We got moving only at 1610hrs. We again stopped for passenger pick-up at Yeshwantpur (1619hrs). The last pickup in Bangalore was at Jalahalli cross – here too, we had to wait for some time (1631hrs to 1636hrs). We passed 8th mile at 1639hrs. From here, the bus enters the “access restricted tollway” towards Nelamangala. The driver made a much disciplined progress on the highway – not over speeding at any point of time, and maintaining steady pace most of the time. We stopped at Tumkur bypass to pick-up a passenger (1731hrs). Here we crossed an SRS B9R- guess it was coming from Ahmedabad going by timings. We left Tumkur at 1733hrs. I dozed off for a while after Tumkur. There were lots of diversions on the road – the bus kept exiting the highway and taking the service road every now and then. The driver did not overspeed, but we managed to overtake a Neeta B9R (This bus had left some 30 minutes before us from Anand Rao Circle). After the first movie got over, they played another one – this one was Kannada movie. The run was uneventful. We pulled into Hotel Vijayanand at Chitradurga at 1922hrs. This one is a massive facility – a huge parking yard, a fueling station, an array of toilets and a restaurant. They have a time-keeping point here, and the crew are required to report to the station. The restaurant had hardly anything to eat at that time. We left Chitradurga at 1941hrs. While the bus was about to start, the person at the counter informed the crew about pick-up at Davangere (rather, the crew were reminded). We pulled into Davangere for pick-up at 2035hrs. A few passengers got in, and the bus started off at 2039hrs. The bus ran through the service road for a long time and then entered back on the highway. I dozed off for some more time – by now the movie was switched off. I woke up just as the bus was pulling into a restaurant for Dinner – the time was 2119hrs. That was at Deol’s Punjabi Hotel, somewhere on the outskirts of Ranebennur. It was more of a dhaba. 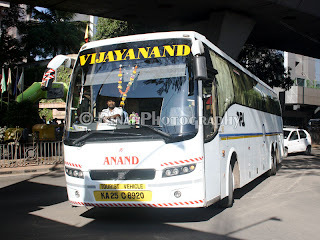 Soon after we stopped, a KSRTC Airavat Club Class (Mysore-Shimoga-Mumbai) and National Travels B9R “Paalki” joined in. By the time we were ready to leave, another Airavat Club Class and the Bangalore-Mumbai Neeta B9R (which we had overtaken before Chitradurga) came in. We left at 2150hrs. The second driver took over after dinner. I slept after some time. The bus stopped at Katraj, at 0515hrs – some passengers got off. We stopped again at Wakad (0540hrs) to drop a couple of passengers. The driver maintained steady pace on the highway – no honking, no rash cuts. He stopped just past the Talegaon toll plaza on the Mumbai expressway – at 0556hrs. I got off the bus to use the restroom – it was chilling cold outside. I felt the temperature was optimum in the bus. The bus started off at 0610hrs. The pace was constant, and the driver stuck to the mid lane for most of the time. We exited the highway and stopped for drop at Kalamboli – at 0713hrs. There was one more VRL B9R parked on the road side – that was a break down. Passengers from that bus were moved to our bus, and we continued the journey. We stopped for another drop at Kharghar (0722hrs). Finally was dropped off at CBD Belapur, at 0725hrs. Just as I picked my baggage, the attendant asked for a tip – this is something I hate. Tip is something passengers give as a token of appreciation, not demanded. We took a rickshaw to reach our hotel. There ended the outbound journey – and starts a visit to Mumbai after three long years. End remarks: The bus, KA-25-C-8920, had some 4.6 Lakh kms on the odo. The bus was maintained fairly well – I wouldn’t call it excellent, but surely good. The interiors appeared a bit tired. Both the drivers did an excellent job – no over-speeding, no unwanted honking at night, light use inside the cabin was limited – but the attendant did shout out aloud waking all the passengers at drop points. The crew appeared professional in their uniform, and behaved properly to passengers. One passenger did irritate both the crew by asking the expected arrival time at Mumbai – drivers usually consider that a bad omen, and hence were irritated at the question. They did not lose their cool while answering though. Overall, the service quality was good. The running time was 15h44m. Given the time they reached Belapur, they'd have surely reached Borivali at the scheduled arrival time of 9AM itself. Will I take this service again: Surely, why not? I am not a regular passenger on the route – so I may not take the particular service, but would surely love to try VRL on some other route.